Aldrovanda vesiculosa L. is one of the most widespread but rarest carnivorous plants. It is a sure bet that few of you have ever seen it, let alone successfully grown it. This aquatic possesses the same kind of sophisticated traps as its larger and better-known relative, Dionaea muscipula. Are these incredible leaves the latest, most recent development in arthropod-catching strategies? The answer is no, as shown by the fossil record. Some seed fragments from a species named Palaeoaldrovanda splendens were found in the south of the Czech Republic (Knobloch & Mai, 1984, 1986). They date from the end of the Cretaceous period (Senonian epoch, 85-75 MYAl) (1MYA means Millions of Years Ago, and notes the age of a fossil or geologic time period. ), and are the oldest known remains of a carnivorous plant! But this does not mean that Aldrovanda is the oldest carnivorous genus-for example it is noteworthy that the Australian sundews possess similar tentacles. This proves that Drosera traps are at least as old as the separation of Australia from the other continents (which occurred during the late Cretaceous period to Eocene epoch) even if no pre-Tertiary sundew fossils have been found anywhere. Palaeoaldrovanda grew on tropical islands inhabited by smallish Dinosaurs, which characterized the geography of Europe during the Cretaceous. Ten million years after the Senonian epoch, the world was hit by a wave of mass-extinctions. The Paleocene (65-55 MYA) was the first epoch of the Tertiary period. The living world slowly recovered from the mass extinctions under a markedly cooler climate. Some Aldrovanda pollen from Germany may date from this time (Krutzsch, 1970a), the first sign that this tropical genus was able to withstand less favorable conditions. In contrast, the Eocene (55-38 MYA) was an epoch of uniformly warm climates. Conditions in western and central Europe were much like those in present day Malaysia. As could be expected, our sun-loving Aldrovanda species prospered. Not one, but several species appear to have existed (Figure 1). Aldrovanda seeds (A. ovata and possibly already A. intermedia) have been recovered from geological layers from this age on the Isle of Wight and in the Hampshire Basin in south England (Reid & Chandler, 1926; Collinson, 1990). 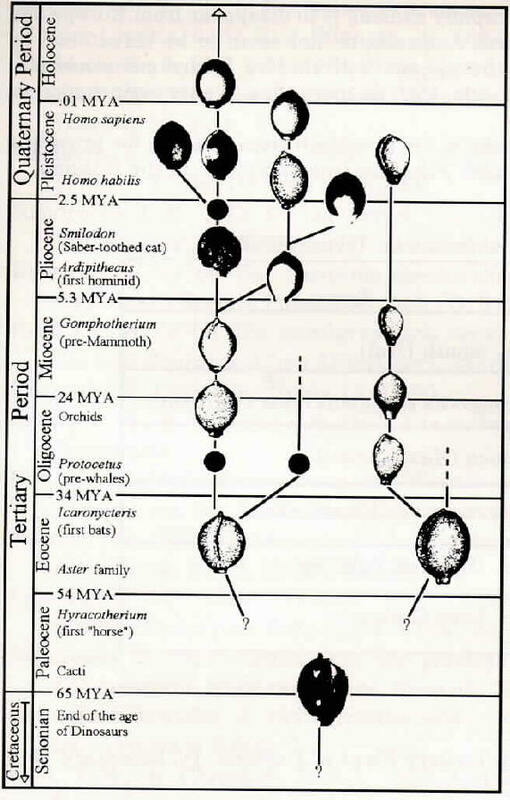 Krutzsch (1985) mentions Eocene epoch seeds from the Weissel Basin in eastern Germany. Pollen, another type of fossil, has been recovered from three areas: Saxonipollis saxonicus (An extinct plant, possibly a precursor to Aldrovanda, or a close relative of this precursor-ed.) from eastern Germany (Krutzsch, 1970a), a similar type from the early Eocene of Belgium (Krutzsch & Vanhoorne, 1970; Krutzsch, 1970a), and finally Kazakhstan (west Siberia) with pollens of two size classes (Table 1). Although smaller and larger grains are also known in the case of Saxonipollis (Krutzsch, 1970a), the Siberian pollens have been described as belonging to two distinct species: A. unica and A. kuprianovae (Kondratiov, 1973). These are fossils from seeds and pollen: but what did the plants that produced these look like? We have no idea, and it is very improbable that leaf fossils from Aldrovanda will ever be found. Dried plants from this species are feather-light. Most of the fresh weight is water, and there is hardly enough dry matter to allow their preservation as fossils. All one can say is that, judging from the accompanying flora, prehistoric Aldrovanda already inhabited wetland areas (Mai, 1985). They grew in biotopes comparable to the modern ones: bogs in the middle of pine woods and reed marshes (Schneider, 1990), temporary ponds in dry areas-not deserts as in what is now sub-Saharan Africa (Collinson, 1990) or coastal swamps (Friis, 1975). If they were aquatic, the ancestral waterwheel plants could hardly have possessed sticky traps. If they had any traps at all, the best guess is that these were similar to those of the modern species. The Eocene epoch fossil finds from England and Belgium lie well outside the present range of the species. The presence of seeds and pollen implies that Aldrovanda did produce flowers in these sites. Present conditions are not good enough for it to do so anywhere in Europe, where it is said to only reproduce vegetatively. So the real range during the Eocene may have been even larger than we can tell from fossils! Based on seed size and the symmetry and prominence of the germination cleft, the genus Aldrovanda has been divided into three sections: Aldrovanda, Obliquae and Clavatae (Dorofeev, 1968; Mai, 1985; Iakubovskaya, 1991). One cannot say whether this has any bearing on what the various species looked like. (Drawings of seeds are shown in Figure 2.) The distinctions between species have also been criticized (Friis, 1980). Recent scanning electron microscope investigations of the seed structure seem to confirm the existence of different species (Iakubovskaya, 1991). There is also often an uncertainty in determining the ages of the geological layers where the fossils are found. So the phylogenetic tree of Aldrovanda is still rather fuzzy. During the following epoch, the Oligocene (38-22 MYA), the climate became cooler and drier. Curiously, the tropical water-plants appear to have been less sensitive to these changes than their terrestrial counterparts (Mai, 1985). Oligocene Europe harbored A. intermedia (south England: Reid & Chandler, 1926; eastern Germany: Walther, 1990), and west Siberia had A. sobolevii (Dorofeev, 1968). This pair of related plants is one of many which prove the existence of contacts between these two regions (Mai, 1985). Figure 1: The evolution of Aldrovanda may be inferred from seed fossils. Many species existed in the past. This figure was created by B. Meyers-Rice and J. Schlauer. For the sources consulted, see the figure references. The Miocene epoch (22-5 MYA) was characterized by alternating much cooler and slightly warmer periods, more so in western Europe than in Kazakhstan (Mai, 1985). It is astonishing how some representatives of the Palaeotropical flora, including Aldrovanda, manage to occur in Europe tens of millions of years after the tropical landscapes that were their true setting had van­ished. The fossil seeds seem to indicate three species: A. praevesiculosa (Germany: Kirchheimer, 1941a; Noetzold, 1961; Denmark: Friis, 1975, 1980, 1985; Poland: Raniecka-Bobrovska, 1959), A. nana (Bielorussia: Dorofeev, 1960) and A. clavata in Kazakhstan (Dorofeev, 1963). Fossil pollen, maybe from one of these species, was found in the southern Ural (Cigurjajeva, 1956, cf. Krutzsch, 1970a, p. 421). A. praevesiculosa was still found in the late Miocene (Palamarev, 1990) and Pliocene epochs (5-7 MYA) of Bulgaria (Palamarev, 1970). West Siberia harbored A. eleanorae (Nikitin, 1957), and contained A. europaea (Iakubovskaya, 1991). Figure 2: Drawings of seed fossils assembled by B. Meyers-Rice and J. Schlauer. The placement of fossils on this figure follow Figure 1. Black disks were used where no drawings were available. See figure references. The Pleistocene epoch glaciations meant a new and severe strain on the Aldrovanda populations. So you would expect to find fewer species? Wrong! What one actually witnesses is a staged extinction of the genus. Isolated sanctuaries in southern Russia and in the Ukraine allowed the formation of local species (Velichkevich, 1990a). During interglacial periods these reoccupied the areas lost, only to be killed off during the next glaciation. Newly evolved species replaced them when temperatures rose again. This makes Aldrovanda a very useful marker for dating soil samples, and for that reason the species is well known to paleobotanists. For example, the sediments from three interglacial periods from Bielorussia contain fossils of A. sp., A. borysthenica Wieliczk and A. dokturovskyi Dorofeev, respectively (Velichkevich, 1990b). A few other species from the same area have been described recently: A. zussii, A. rugosa, and two unnamed ones (Iakubovskaya, 1991). At present the southern continents Africa and Australia are in contact with Eurasia. They have been colonized by the species that is typical of the interglacial period we live in. That is also shown by the fossils that date from since the upper Pleistocene (Kirchheimer, 1941b; Hartz, 1909, see Friis, 1980), namely Aldrovanda vesiculosa. As it does occur in tropical areas, the genus seems safe from extinction. Even though human activities are rapidly causing it to disappear from Europe and Japan, the sites in Africa and North Australia do not seem to be threatened by mankind. Perhaps this is where the species will survive future environmental changes. So the sad story of Aldrovanda, with its more than twenty extinct species, still ends on a rather positive note! Acknowledgements: many thanks to Dr. Knobloch from Prague, for providing difficult to obtain papers, and to Ludek Frkal for translations from the Russian. Chandler, M.E.J. 1964, The Lower Tertiary Flora of England. IV. Summary, Bull. Br. Mus. (Nat. Hist. ), Geol. 12: 1-151. Cigurjajeva, A.A. 1956, Atlas of Microspores from Tertiary layers in the U.S.S.R. (Russ. ), Charkov-Saratov. Collinson, M.A. 1990, The vegetational change during the Palaeogene in the coastal wetlands of South England. Proc. Sympos. on Palaeofloristic and Palaeoclimatic changes in the Cretaceous and Tertiary, General Survey Publisher, Prague: 135-139. Dorofeev, P. I. 1960, O tretitshnoi flore Bielorussii. Bot. Zhurnal, 45: 1418-1434. Dorofeev, P. I. 1963, 'Iretitshnie flory zapadnoi Sibiri. Izd. Akad. Nauk. SSSR. Dorofeev, P. I. 1965, Ob oligotsenovoi flore Zaural'ia. Paleontol. Zhurnal, 2: 111-119. Friis, E.-M. 1975, Climatic implications of microcarpological analyses of the Miocene Fasterholt flora. Bull. Geol. soc. Denmark, 24: 179-191. Friis, E.-M. 1980, Microcarpological Studies of Middle Miocene Floras of Western Denmark. Ph.D. Thesis, Aarhus Universitet, 183-186. Friis, E.-M. 1985, Angiosperm Fruits and Seeds from the Middle Miocene of Jutland (Denmark). Biologiske Skrifter, 24: 54-55. Hartz, N. 1909, Bidrag til Danmarks tertiaere og diluviale flora. Danm. geol. Unders., 20: 1-271. Iakubovskaya, T.V. 1991, Rod Aldrovanda (Droseraceae) v Plieistotsenie Bielorussii. Bot. Zhurnal, 76 (1): 109-118, and tables I-II. Kirchheimer, F. 1941a, Ueber ein Vorkommen der Gattung Aldrovanda L. im Alttertiaer Thueringens. Braunkohle, 40: 308-311. Kirchheimer, F. 1941b, Ein neuer Beitrag zur Kenntniss den Braunkohlenflora in der Lausitz. Beitr. Biol. Pflanzen, 27: 189-231. Knobloch, E., & Mai, D.H. 1984, Neue Gattungen nach Frűchten and Samen aus dem Cenoman bis Maastricht (Kreide) von Mitteleuropa. Feddes Repert. (Berlin), 95: 3-41. 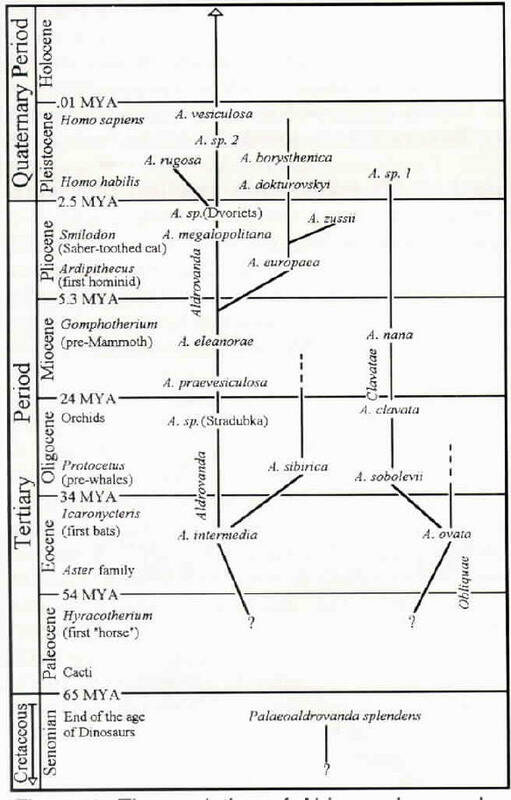 Knobloch, E., & Mai, D.H. 1986, in: Rozpravy Ustredniho Ustavu Geologickeho (Praha), 47: 98, 169, and table XXV. Kondratiov, G.K. 1973, Pyl'tsa novych vidov Aldrovanda iz Eotsenia Priangar'ia. Bot. Zhurnal, 58 (6): 878-879. Krutzsch, W. 1970a, Zur Kenntnis fossiler disperses Tetradenpollen. Abh. Zentr. Geol. Inst. (Berlin), Palaeontol. Abh., B. 3 (3): 399-433. Krutzsch, W. 1970b, Die stratigraphisch verwertbaren Sporen- and Pollenformen des mitteleuropaeischen Alttertiaers. Jahrb. Geol. Bot. (Berlin): 309-379. Krutzsch, W. 1985, Gleditschia 13 (1): 90. Krutzsch, W., & Vanhoorne, R. 1970, Die Pollenflora von Epinois and Loksbergen. Antwerpen. Mai, D. H. 1985, Entwicklung den Wasser- and Sumpfpflanzen-Gesellschaften Europas von den Kreide bis ins Quartaer. Flora, 176: 449-511. Nikitin, P.A. 1957, Pliotsenovie i tshetvertitshnie flory Voronezhkoi Oblasti. Izd. Akad. nauk. SSSR, Moskva-Leningrad. Palamarev, E. 1970, Fossile Floren aus Drei Braunkohlenbecken in Suedwestbulgarien. Bulg. Akad. Nauk., 20: 35-79. Palamarev, E. 1990, Grundzuege den palaeofloristischen Palaeosukzessionen im Spaetmiozaen Bulgariens. Proc. Sympos. : 257-263. Raniecka-Bobrovska, J. 1959, Trzeciorzedowa flora nasienne z Konina. Z bordan trzeciorzeda w Polsce, 2. Reid, E.M., & Chandler, M.E.J. 1926, Catalogue of Cainozoic plants in the Department of Geology. Vol. 1 The Bembridge Flora. Br. Mus. (Nat. Hist. ), London. Schneider, W. 1990, Floral succession in Miocene bogs of Central Europe. Proc. Sympos. : 205-212. Velichkevich, F. J. 1990a, The late-Pliocene Floras of Byelorussia. Proc. Sympos. : 273-276. Velichkevich, F. J. 1990b, Pliocene relicts in the Pleistocene flora of Byelorussia. Proc. Sympos. : 281-283. Walther, H. 1990, The Weisselster Basin (G.D.R.). Proc. Sympos. : 149-158. Iakubovskaya, T. V. 1991, Rod Aldrovanda (Droseraceae) v Plieistotsenie Bielorussii. Bot. Zhurnal, 76 (1): 109-118, and tables I-II. Mai, D. H. 1995, Tertiäre Vegetations-Geschichte Europas, Fischer, Jena, p.181 Fig. 67. Weyland, H., Pflug, H. D., Marinos, G., and Anastopoulos, J. 1961, Palaeontographica B 108: t. 18 fig. 10. Knobloch, E., and Mai, D. H. 1984, Feddes Repent, 95: t. IX fig. 11.